Preheat oven to 400F. Coat 9�?13-inch baking dish with cooking spray. 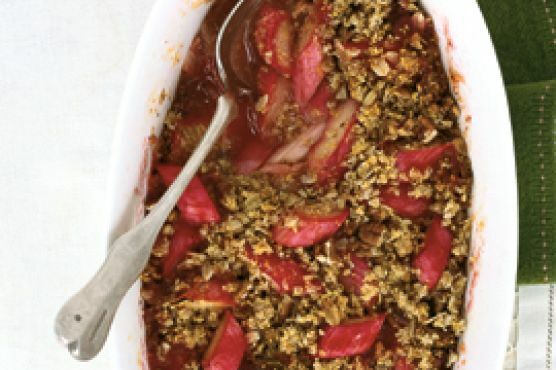 To make Rhubarb Filling: Toss together all ingredients in glass or other nonreactive bowl. Cream Sherry, Moscato d'Asti, and Port are great choices for Crumble. A common wine pairing rule is to make sure your wine is sweeter than your food. Delicate desserts go well with Moscato d'Asti, nutty desserts with cream sherry, and caramel or chocolate desserts pair well with port.